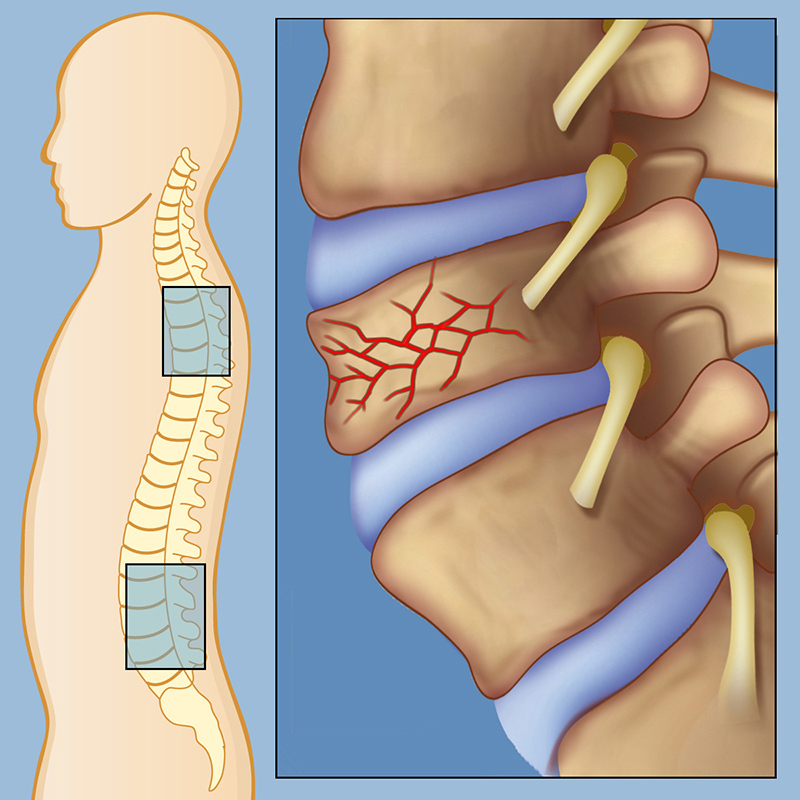 A spinal compression fracture occurs when pressure is placed on weakened vertebrae, which develop cracks or breaks. Spinal compression fractures, also called vertebral compression fractures, are cracks or breaks in the bones of the spine that are caused by too much pressure placed on them. Healthy bones can normally withstand quite a bit of pressure. If bones are weakened by tumor or osteoporosis, however, they can break with even mild trauma. Compression fractures of the spine usually occur in the lumbar, or lower, region of the spine, but can sometimes occur in the thoracic spine at the level of the chest. Compression fractures can be extremely painful and disabling, and can cause instability that increases the risk damage to the nerves or spinal cord. They may even have an adverse effect on cardiopulmonary function. Osteoporosis: The most common cause of stress fractures, osteoporosis is a condition in which the bones lose their density, becoming very brittle and at risk for fractures. This bone disease occurs mostly in women over 50. Trauma: Even minor falls can cause a spinal compression fracture in a person with severely weakened bones. Disease: Bone tumors such as metastatic cancer and multiple myeloma can weaken the bones and cause fractures. 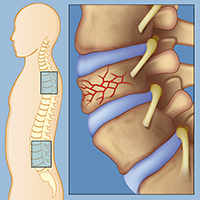 The growth of spinal tumors can place excess pressure on the vertebrae and cause fractures as well. Reviewed by Athos Patsalides, M.D.